When you think of summer, what is the first thing that comes to your mind? Like many people, you probably think about good times in the warm sunshine, backyard barbecues and getting together with family and friends. If you are ready to take your next barbecue to a new level, this is the DIY project for you. All you need to get started are a few old pallets, an old refrigerator and an afternoon of work. In some cases, you may have an old refrigerator laying around and you may have been thinking about tossing it to the curb. As you are probably aware, throwing out a refrigerator can be expensive, depending upon where you live. 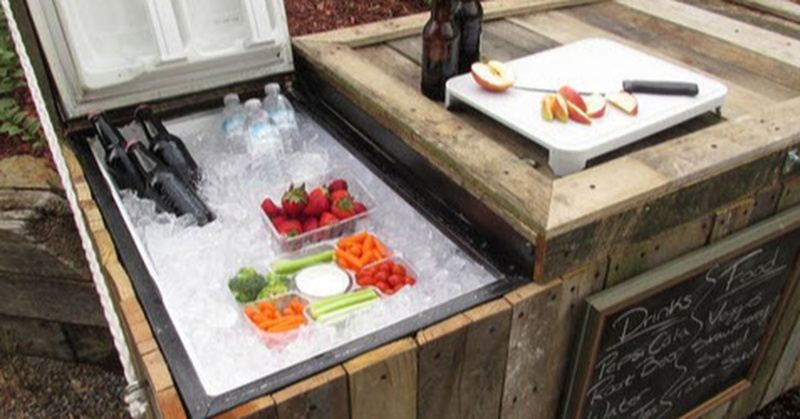 This project allows you to turn that old refrigerator into an outdoor bar and cooler. Not only does it keep beverages cool, it allows you to serve them up in style. You only need a few basic items to get started, aside from a refrigerator and you will be well on your way. This is the brainchild of Matt2Silver and it is the perfect project for somebody who wants to create something awesome without spending a lot of money. He claims to have spent about $40 on the project along with the old refrigerator that he had available.